Social networking has become an inevitable part of daily life. The day is incomplete without an update on social network. Facebook, Twitter, LinkedIn, and blogs have become notable part of succeeding careers. Not only it keeps you updated with the world around you, but it also helps you to connect and communicate with them. Now getting in touch with a man, seven continents far, has become a work of just a click. Where social media has brought the whole world under a web, it has also added a stair to get high on career. Getting knowledge about the career, recent trends in industries, watching your industry ideals life updates and getting connected to your dream company has become easy. And as all know twitter is the second love of the companies and recruiters. With increasing popularity of twitter in social media, it has become a way to search job or share your resume too. Before using it for some reason, you need to explore the insights of twitter. It’s important to get in the twitter, visit profiles, follow people, check how they are using twitter and uncover the hidden things. Understanding twitter would help you get easy with it and make a way to your search. Searching for the job is your main goal but you also need to discover your secondary goals. They would be, meeting people of your career industry, following their daily tweets, understanding their psychology, getting more nearer to your industry. This would be your first step towards your main goal but don’t just don’t get lazy with this step. Keep going on with your main goal too. Social networking is not all about connecting with your friends, family and colleagues. Signing up twitter for job search needs your profile to be professional before connecting to your dear ones. So just skip the twitter advice on sign up to connect your friends, for now. Your profile needs to be impressive enough that it attracts the people you connect. It’s your industry and you need to advertise yourself in front of them to get to them. So be professional with every line you write about yourself, people you follow and every tweet you do. Mention your skills and try to unhide that you’re available there for job. Tool like Twhirl and mobile.twitter.com from any mobile can be a good choice of tool. Standard Web interface is also a fine tool to be used and it’s what mostly used by people. Other tools like TweetDeck and Seesmic Desktop are worth trying, which would help in organizing and categorizing the people and organizations you follow. There’s also Twit terrific for the Mac, the good looking Snitter and Logpost for mobile phones is also an option in applications. The multi-platform Spaz and Pwytter Twitter, iTweet.Net,fring are tools if you have a WordPress blog and, the Twitter Google Gadget, Twadget on Windows Vista and many more. Customize your settings and agree to the option of automatic follow. It means that anyone who follows you, you automatically follow them. This would help you to get in contact with more people and also keep filtering out unnecessary contact time-to-time to unfollow the spam followers and the ones who are not interesting to be there on your profile. Connect with a service like su.pr or bit.ly that are shorter urls used for sharing links on twitter. They help you to track down that how many people check out that link. Even if you’ve already tweeted a link before, you can always create a new “short url” for every link you share any time, so that you can discover the number of clicks separately for every link. Let your tweets be worth to be shared and provides value to the people following you. Sharing of news and different resource links about your profession, writing about different topics, sharing your worth views, replying on different tweets, would make you enjoy yourself while helping your followers to you know you better and feel satisfied to follow you..
To pace up the process of following and getting followed share up your email on twitter through setting. Twitter’s Find People tool can be used to invite your email friends, colleagues and contacts to follow you, and your Twitter profile is ready to show case. Using twitter search start to look for people who have been twittering about job vacancies and follow them if you can sense it could happen again. Go for keywords search and follow the related searches results. Also, notice how people respond to these offers. It would help you in future. You can also use Twitter job feeds guide to get to know and follow job openings in your country, region or city in your industry. When you get to know about some job opening follow the tweet, reply to it, save it and try to get conversation with recruiter. After you have searched for the job in your industry and have replied to it, Recruiter would now like to know you better. Your resume is the key to your recruitment. You need to keep an updated resume with yourself so that whenever necessary you can share it with the recruiter. 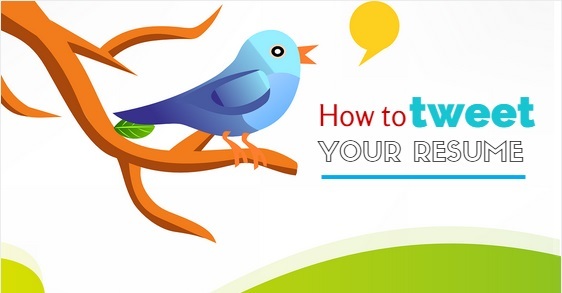 The first challenge to make your twitter resume to be: Compact and Easy to get. There have been link shortening applications available on web which helps you to shorten the links you share so that they don’ take up all the characters available to you. Bit.ly or TinyURL are among the famous applications for this work. Twitter has brought all the conversations under hashtags making them short and to the point. Where the words get shorter they become a link to which could be searched and get you to the related pages. Like for searching jobs you use hashtag #job, similarly recruiters use keywords like resume, CV, location. Skills etc to search for potential candidates. So now to make your resume show cased on twitter you just need to use maximum of these keywords so that you could be found whenever any of keyword is searched. For e.g., #needajob, #jobrequired, etc. Do give brief detail about where you want to do the job. It’s important that you define the type of job you want to do so that you can get best job offers. Don’t forget to put in keywords with hash tags in your tweet every time you share up your resume. Do give link to your homepage or other social media profile like Google+ or LinkedIn so that they can get to know more about you. Once you have put them all together, you have finally connected yourself to a big source of connections. Now you’ve entered in the list of job seekers and books of recruiters. Being increasingly favorable social networking site, it has been favorite of many company heads that have been searching their employees through twitter and giving out jobs to them. When you have a chance to get in touch with recruiters of the whole world, know their needs, strategies, work requirements and show them out your potentials then why not go for it. Its complications should not hold you back from going on to a job search or tweeting your potentials, skills, knowledge, and your resume on twitter. Challenging roads have beautiful ends so does the jobs through twitter because it’s not just a social site now, it’s a status class and used by high professionals. So take a step towards planning your career, trying out best for yourself in the industry and making more of contacts to build your career and achieve success. Nothing is impossible even 140 characters can’t stop you from getting in there. So go and tweet yourself for the best in future. All the best.